"Cooking the books" is a firm part of German culture going back deep into history. In its most honorable and useful form, Oscar Schindler was able to falsify his output figures to gain income for his rescue operations. During the time of the German Democratic Republic falsification of performance statistics was a bitter necessity for survival in a state held together only by its lies. The state of Hessen prides itself on having one of the lowest incidence rates of Neo-Nazi activities in the whole of the Federal Republic. The Minster of the Interior Bouffier said on publication of the report for 2002 by Hessen's Intelligence service that the activities of the extreme right were on the decline and that Hessen was no playground for extreme right activities. An apparent confirmation of this appeared in the world famous German news magazine "Spiegel" in Sep. 2003 ( see www.spiegel.de Archive Edition no 39/03 ) showing an incidence rate of 22 compared to e.g. 89 in Saxony. If one took the trouble to convert the figures to rates per head of population, Hessen might show up even better. This would be of course be a useless exercise if one had any reason to suspect the base figures in the first place. The most effective way to falsify negative statistics is of course to ensure that they do not get raised in the first place. For Neo-Nazi activities all you have to do is prevent these manifestations from featuring in any due process of law. No statistics ? Great ! The gleeful Neo-Nazis can continue with their perversions, the lassitude shown to them brings in the right wing votes for the main parties ( like Hohmann's speech ), and the state of Hessen can continue to play the favorite pupil at federal level. Everyone happy. There are cases in Hessen, where Nazi and Neo-Nazi activities have not been prosecuted and here we would like to present the 'Wolfsangel' affair. What is a 'Wolfsangel' ? The Wolfsangel is an old symbol of Nordic mysticism which was supposed to have had magical qualities for trapping wolves. The symbol was adopted during the times of the Third Reich notably by Hitler's SS-Unit "Das Reich" as a divisional marking. The symbol was also used as vehicle markings for SS-Units from 1939-1943. ( see Fig 1 below ) . The 'Wolfsangel' is also used by Neo-Nazi groups today ( see Table 3 below ). German Criminal Law Para 86(1).4 prescribes prison sentences of up to three years duration or fines for the display of such symbols furthering the cause of the former Third Reich. Para 86a lays down similar punishments for the possession and or display of any substitute symbols of Neo-Nazism such as the Wolfsangel in the context of todays extremist political objectives. Fig1. The 'Wolfsangel' was used variously by SS-Units during WW2 from 1939-1945. Last used by 2.SS-Panzerdivision "Das Reich". Today it is a well-known symbol of Neo-Nazism or of continued preservation of the die-hard idealism of the Third Reich. Fig 1a Members of the 2. SS-Division "Das Reich" sporting the Wolfsangel on their motor-bikes. By Courtesy of the Military History Society of Canada. The last known SS-Unit to have used the Wolfsangel as an emblem was the 2. SS-Panzerdivision. The deeds of such former SS-Units continue to be glorified all over Germany. Neo-Nazis and Old-Nazis appear reguarly in public with the Slogan "Ruhm und Ehre der Waffen-SS" ( Honor and Glory to the Waffen-SS). The use of this Slogan was deemed by the High Court in Cologne in Nov. 2002 to be a punishable offence. The 2.SS-Panzerdivision perpetrated the massacre of Oradour sur Glane on June 10 1944 during which 642 civilians, including 207 children were murdered in the most barbaric way imaginable. A two year old child who had been bayonetted to death for instance was found pushed down a lavatory. Some heros for posthumous glorification ! At an exhibition of hate symbols in Bad-Nauheim on 11. November 2002 Dr. Ulrich Brosa took up contact with Ms. Irmela Mensah-Schramm ( see Addendum), who runs a campaign for the removal of Neo-Nazi symbols from public places in Germany. Her enviable convictions lead her to travel from Berlin all over Germany to personally and demonstrably remove Neo-Nazi hate-symbols from public places by painting over them. At this stage one must ask why this should be necessary in Germany in the new millennium. On that November day, Dr. Brosa took Ms. Mensah-Schramm to Kirchhain to show her the Symbols painted on the outhouse of no. 58 Drosselweg in Kirchhain. The two activists rang the doorbell, which was answered by a young lady who identified herself as a 'Tenant' of the house-owner, who she said was not available for consultation. Ms Mensah-Schramm told the young lady that the symbols on display on the house were prohibited and that these must be removed on pain of criminal prosecution. The two activists then departed. Ms Mensah-Schramm returned to the house with Dr. Brosa on 22.03.2003 to find the symbols still on display. Deciding that now action should be taken, Dr. Brosa put a ladder up to the wall of the garage in preparation for over-painting the symbols. Ms Mensah-Schramm called the police requesting protection for the operation. At this stage the house-owner appeared and a discussion ensued, during which the house-owner maintained that he was unaware of the significance of the symbols. Fig 2. 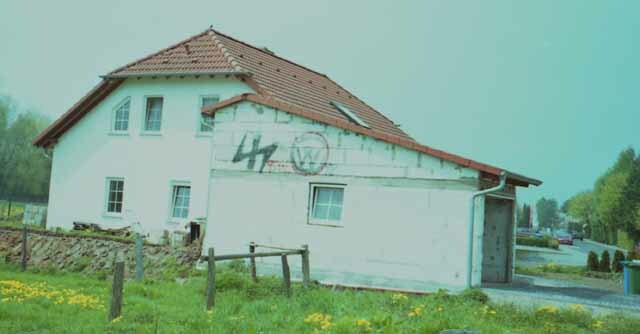 The house at no 58 Drosselweg, Kirchhain, Hessen, Germany showing the Nazi- and racialist-symbols. Note 1: The 'Wolfsangel' is shown on the left. The '88' in Red means "Heil Hitler". The "W" is probably either the symbol of the former "World Church of the Creator" now called the "World Creativity Movement" or the German branch of the "White Aryan Resistance", both extremely vicious racialist white supremacy organisations. Note 2: The Symbols are about one meter high which would be outside the scope of casual Graffiti. Criminal charges were filed by Dr Brosa on 13.03.2003 and by the Anti-Racial Telephone Service, Marburg on 15.03.2003. In his submission Dr Brosa pointed out that the house is only about 5 minutes walk from the magistrates court in Kirchhain and many of the magistrates and court officials would probably have seen the symbols over the approximate five year period. He also drew attention to the fact that a member of the DA's office was resident in the area and, therefore, must also have known about the symbols. "For heaven's sake don't define anything, someone could catch you out". Well, they didn't but we did anyway. With inadequate tasking the police had no choice but to jump in with both feet and interrogate the house owner which they did on 06.05.03. His story for the police was that he didn't know who had painted the symbols on his house, but that they had probably been there since 1995 as he had built the house. He said that he had not been aware that the symbols were illegal. This version is, however, somewhat different to that which he dished up to Ms Mensah-Schramm and Dr. Brosa on 22.03.03, when he claimed that the symbols would represent his initials and the first love of his life ( perhaps the '88' means that Adolf Hitler had been the first love of his life ). If he knew that, the why did he not know who had put the symbols there in the first place ? Ms Mensah-Schramm reported this version in her statement to the police in Berlin on 05.06.03. The substantial contradiction did not bother the DA's office in Marburg: No new interrogations were ordered. 1. The task-sheet did not give any indication as to what offences were supposed to have been committed. 2. The task-sheet did not define any case-specific issues to be examined. 3. No list of possible witnesses was provided for the taking of statements. 5. No attempt was made to establish the current significance of the symbols or to determine what ideologies would lie behind their use. 6. Witness statements were taken in the wrong sequence, producing a substantial contradiction, which could only have resolved by a second interrogation of the accused. If necessary, Dr. Brosa could also have been interrogated. As it happened, the contradiction was ignored anyway. 7. The house-owner's tenant was not interrogated for the purpose of ascertaining why the house-owner allowed the symbols to remain on his house in the 6-month period from the date of the first visit by Dr. Brosa and Ms Mensah Schramm on 10.11.2001. 8. Nobody thought to ask the house owner about his political views. It would not have been a difficult task, even for novices, to extract that kind of information from an extremist, if such the accused had been. "to start proceedings and to responsibly take a statement from the accused ............... who according to public records is the house-owner. The above tasking together with the complaint from private citizen Dr. Brosa was all the information thse DA's office sent to the police. For the management of an investigation in the above quality, most DAs outside Germany could expect to dismissed from their posts. It is not possible to blame the police for the defective investigation because they were not given enough information at the outset. Probably for the same reason, the police photographs of the house were not good enough to make out the smaller symbols on the wall. The photographs shown in this report were provided by Dr. Brosa and Ms. Irmela Mensah-Schramm. The standard of police work is invariably very much higher than that of the DAs in Germany. How senior policemen come to terms with such workmanship coming from the DAs is quite a mystery. As far as we can ascertain, the correct procedures for DAs in such cases would be to call in the state police ( Landeskriminalamt ) who in turn should alert the intelligence services. For the purposes of the private citizen it is immaterial whether or not the correct procedures were adopted in this case, because a standard investigation could have produced a correct result. The hullabaloo from official places and a further complaint from the Anti-Racial Telephone Service, Marburg seem to have caused the town council in Kirchhain to sit bolt-upright in bed: In a letter dated 08.04.2003, the Town Clerk ordered the house owner to remove the symbols from his house. One must ask, why this letter took over five years to write. On 22.07.2003 Dr. Brosa and Ms Mensah-Schramm submitted a complaint against the termination of the investigation, pointing in particular to the contradiction between the accussed's account and that of a material witness. This would be a strong indication that the accused had lied to the police during his interrogation on 05.05.2003. 1. The Wolfsangel is not recognizable as such. 4. The '88'-sign was not mentioned. 5. The accused did not know he was breaking the law. Point 1: The Wolfsangel is not recognizable as such. 1. The Wolfsangel as divisional emblem of the 2.SS-Panzerdivision. 2. The Wolfsangel as used by various Neo-Nazi groups throughout the world. 3. 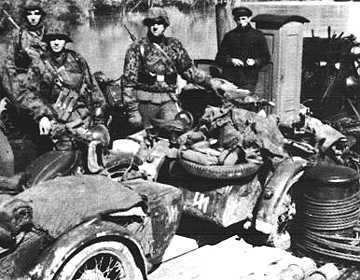 The Wolfsangel on a military vehicle used by SS-Units from 1939-1943. 4. The Wolfsangel in use as wall decoration on a house in Kirchhain, Hessen, Germany. Note: Just compare Anders' statement to the illustrations in line 1 of this table. 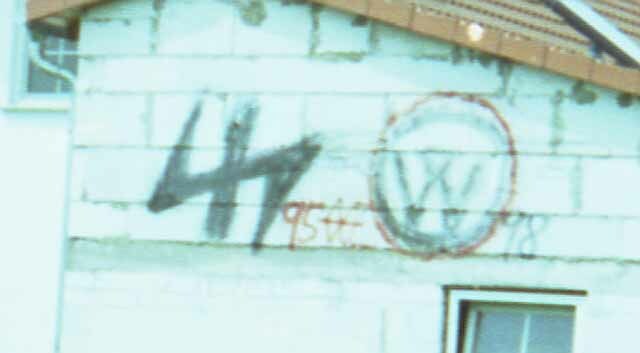 Suspected "Fraudulent Redressal by Substitution"
"The 'Wolfsangel' as the symbol of the prohibited 'Youth Front' falls within the provisions of Paragraph 86a of criminal law"
"The resemblance ( of the house graffiti ) to a 'Wolfsangel' is only given with a big stretch of the imagination". The fraudulent substitution is more often than not an assertion with which everyone could agree and indeed the NGOs agree with the first part of the above statement completely. However, nobody on the side of the NGOs ever said that the symbol on the house was that of the "Youth Movement" ( which uses the Wolfsangel rotated through 90°). Of course an immediately apparent resemblance of the fraudulent substitute to the SS- / Neo-Nazi symbol on the house could - on the basis of the 90° rotation - be refuted. However the 'Wolfsangel' on the house is optically and for all intents and purposes geometrically identical to the first three illustrations in Table 3. Nobody could seriously dispute that. A fraudulent substitution ( see above ) with the 'Youth Front'-symbol would the door to the technique of partial scrutiny ( it all works so perfectly doesn't it ?). The 'Partial Scrutiny'-Model consists most usually of dealing with the least difficult issues attached to a complaint and ignoring all the others. Such evasion models can only enjoy success in administrations not exercising a proper chain of supervision In this case only the legal issue surrounding the fraudulent substitute were examined. German Law also forbids the use of symbols pertaining to an organisation of the defunct Third Reich. The display of the Wolfsangel as used by the former SS would constitute an offence under the sub-paragraphs of Paras 86(1).4 and 86a of the Criminal Law. This aspect was conveniently omitted. German version of the "White Aryan Resistance"
This vicious white supremacy movement was founded in 1973. It considers Jews and non-whites to be "mud-races". Adolf Hitler is held to be one of the "Churches" most revered Prophets. It is a notorious hate group, whose patterns of violence include murders. Evidence of extensive contacts with German Skin-heads esp the fugitive Möbus. The German 'W's share many of the vicious ideals of their American counterparts. The 'W' is a general-purpose expression of hatred seen on clothing and on banners. The encirclement of the 'W'-sign together with the loop make it resemble the WCOTC-Symbol. However, there are indications that it could also be related to some German version of the "White Aryan Resistance" ( see Epilogue to report below ). The fundamental question related to the investigation by the DA's office in Marburg is, was it a "screw-up" or a "cover-up" ?. Looking at the sequence of events and allowing for the usual standards of workmanship prevailing in DA's offices all over Germany, there would still be enough signs of culpable negligence left over to at least support a cover-up hypothesis. Luckily the two Steadfast citizens Dr. Brosa and Ms. Irmela Mensah-Schramm took the trouble to complain ( see "Complaint against the Termination of the Investigation" see above) on 22.07.2003 to the Minister of Justice Dr. Christean Wagner against the termination of the Marburg investigation. Wagner ordered an examination by Attorney-General Anders. The examination by the Attorney General did indeed cast further light on the suspected cover-up. The Attorney- General's edict of 09.09.2003 is based on the wrong type of 'Wolfsangel'. Relevant English translations are shown in Table 4. The sole use of a false basis for an edict means inevitably that the document in toto worth nothing. For this reason, only the portion relevant to the use of the false basis in the edict has been translated into English: Junk and verisimilitude in German would be the same junk and verisimilitude in English. An Attorney-General who, when confronted with the task of examining a case like the 'Wolfsangel' of Kirchhain, refrains from looking for exact matches in the history books for all the symbols on the house, displays at the very least a conspicuous lack of curiosity. If the same Attorney-General also neglects to find out what the law says about the display of the symbols of the defunct "Third Reich" then he also displays an incredible lack of professional motivation. An Attorney-General who fails to spot the gaping holes in the Marburg-Investigation ( see Table 1 ) is an Attorney-General of multiple incredibilities. Any conclusion other than that the Attorney General's action was a brazen but less than professional cover-up would be very hard to justify. It appears highly unlikely that an honestly conducted legal evaluation could have come to the conclusions reported here. However, in that unlikely event it would merely mean that Anders' cover-up had been precautionary - but a cover-up it was. Supposed Intelligence operations will very likely be a factor in a feverish search for alibis. There are many ways of successfully gathering information but passing up the chance of obtaining valuable Intelligence collateral by sabotaging a regular police investigation is certainly not one of them. Nor would any professional agent worthy of such a description risk a run-in with the regular authorities by painting things conspicuously on the side of his house. ( Sorry, the NGOs won't buy the intelligence alibi ! ). Of course a covert intelligence involvement would in the normal course of events be expected in cases like the 'Wolfsangel'-Affair in Kirchhain. However, the intelligence services were not called in according to proper procedures and must now be wondering how such a golden opportunity could have been ruined for them by the justice authorities. The Skin-heads in Hessen are certainly a big problem, but there will - like Martin Hohmann - always be such people. Much more sinister are the judiciaries, town authorities and citizens of Kirchhain who looked the other way for five years as some of the most evil symbols of racialism and hate known today were prominently displayed in their midst. These are the terrible normals: Typically they are model family-people, they go to church on Sunday, and are kind to children and animals. All supposedly upright citizens. Such people in Germany are more dangerous than all the Nazi-Thugs in the world put together. Member of the Federal Parliament Martin Hohman, who delivered the infamous antisemitic "perpetrator race" speech is also a product of the Hessian electorate. Whilst there will always be people like him, it is particularly disturbing that no action had been taken against Hohmann from inside Germany until a complaint had come from the USA. Plenty of people knew about this speech up to then - it had even been published on the Internet - and did nothing. Germany is the undisputed holder of the most ignominious world record of all time, causing the death of 60 Million people and the murder of countless millions of these by the organs of state. The unchecked re-emergence of the same infantile, simplistic and violent ideologies which in the 1930s lead to the rise of the Third Reich should be viewed as particularly serious on location in Germany today..
Basically, the guilt in the affair is determined by the principle of the "Sin Eater": Either the house owner in Kirchhain is guilty or the Federal Republic of Germany. If the latter, then in a state with sufficient integrity for self-regulation the Attorney-General Dr. Dieter Anders, together with a few of his assistents would be relieved of their duties and awarded a substantial cut in pay and pension rights. Another possibility is a an improved 'Haider-Model' for long overdue sanctions against this unreliable partner in the European Democracies. In the process of compiling supporting evidence for such action the NGOs are certainly very spoiled for choice. Fig 3. 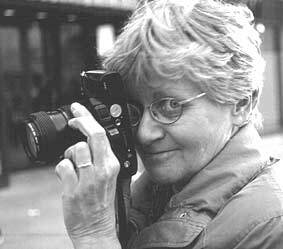 Irmela Mensah-Schramm photographing Hate-Symbols before removing them. Ms Mensah-Schramm makes it her business to travel from Berlin all over Germany to remove Hate-Symbols from public places. Her tools consist of a kitchen knife, a bottle of acetone, filler, paint - and a huge bag of courage. We can safely assume that had Ms Mensah-Schramm - ably supported by Dr Brosa - not taken the matter up, the appalling symbols of new and old Nazism which appeared on no 58 Drosselweg in Kirchhain would not have been removed. In other parts of the Federal Republic, the attitudes have not been found to be substantially different, which leads us to assume that the Mensah-Schramm campaign is a dire necessity. That must be an unpleasant surprise for most people living outside Germany. In 1994 the plucky Irmela Mensah-Schramm was awarded the "Federal Order of Merit Medal" ( "Bundesverdienstmedaille" ). However, she says that she had always been made to feel thoroughly unwanted in official places - a denigrator of her own homeland. In German they call this Syndrome "Nestbeschmutzer" - literally translated, someone who defecates in his own nest. The weak apologists of today in the German Administration use such terms for those who know the difference between right and wrong - just as they did in the 1930s. Incensed by official attitudes and by what she describes as the brazen hypocracy and ignorance of it all, she returned her medal to the government in the year 2000. Ms Mensah-Schramm has to finance her campaign out of her earnings caring for children in a special school. For this reason models for financing and patronage from outside Germany need to be examined. Dr. Ulrich Brosa is a steadfast citizen, who since coming from Berlin in the 90s has been resisting the manifestations of Neo-Nazism for many years in the municipality of Amöneburg, where he lives. For this public-spiritedness he has been the subject of continued violent attacks on his person by the "Sieg-Heilers" in the town. His house has been damaged five times by the right wing thugs, who enjoy the protection and complicity of the Hessian justice authorities. As though that were not enough, Dr. Brosa was also subjected to a cowardly and illegal attack on his civil rights by Attorney-General Anders' people ( upholding some brave old German traditions of a particular kind ) after he had referred to the justice authorities as a criminalized organisation. In leveling these accusations at Anders' organisation Dr Brosa put copious evidence to back his claim on display on the Internet. On the basis of an illegal prosecution by the DA's office in Marburg and a fine by the Chief Magistrate Laudi in Kirchhain for "insult", Brosa's web-site was closed down - only to propagate and multiply itself throughout the world on the sites of other sympathetic NGOs. Every novice in every DAs offices outside Germany knows that a reaction of that kind to criticism is only likely to procure increased prominence and fame. Brosa has gone into the appeal procedure and Laudi's fine is not likely to stand up to much scrutiny at higher levels, we suspect. If necessary, the case will end up before the European Court of Human Rights in Strasbourg. New knowledge-based concepts for the combat of such abuses continue to be developed by some NGOs. These will ensure for the judicial culprits at each level permanent visibility in the "process pedigrees". Vastly different parameters for defining legal abuse have also been identified, which will deny the perpetrators the continued use of copious amounts of written pseudo-judicial pretence to fend off exposure. At the same time, complicity and cover-ups at the higher levels will become increasingly more difficult to disguise and the line of least resistance progressively less easy to identify. A preliminary report in English has been prepared on the case. This English language report will be released as soon as possible. After the belated action by the town council of Kirchhain ( see above "Even the Town Council swings into Action" ), the house-owner removed the symbols in May of this year as can be seen in Fig 4. Fig 6. The house after removal of the prohibited symbols. ( The owner probably does not know who planted the "Death-Head" flag in the garden - on the left of the picture. ). Fig 7a. The symbol of the vicious "White Ayrain Resistance. Fig 7b. This was the central device on the peaked cap worn by SS-Personel. It replaced the "Archery Target Board" used by the Wehrmacht and by the Bundeswehr of today. This is about the closest resemblance to the flag-symbol, would not, however, exclude other criminal usages.